Blues guitarist and musical historian Elijah Wald explains the booing at Bob Dylan’s 1965 Newport Folk Festival performance. PROVO, Utah (Oct. 12, 2016)—The story of Bob Dylan is that of a talented young songwriter/poet who broke the rules of folk music by pulling out an electric guitar at the 1965 Newport Folk Festival. Popular retellings explain that Dylan was booed off the stage by the conservative “folkies” who did not understand that rock was the next big thing. Bob Dylan grew up in northern Minnesota in a virtually all white community, but his musical inspiration came from a radio station broadcast from Shreveport, Louisiana which played black singers performing rhythm and blues. “All over the United States there were all these white teenagers who were discovering black music on the radio, and it was like a secret world for them,” explained Wald. When Dylan went to college he became more interested in folk music. “Folk music had become the collegiate style thanks to the Kingston Trio; fun music like rock and roll, but it was the fun music that the smart kids listened to,” said Wald. Seeger worked to organize the Newport Folk Festival, a yearly festival where the headlining bands would each be paid 50 dollars and draw crowds, while the profits earned by these big names would go toward bringing in a rising generation of folk singers and artists that had rarely performed outside their communities. 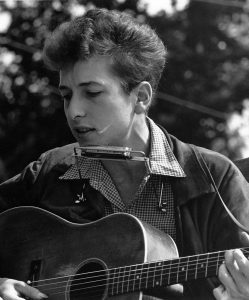 Dylan was one of those young rising folk singers brought in for the festival of 1963, coming off a stint writing political protest songs for a magazine called Broadside. Just a few months later, Dylan would perform at the March on Washin gton. “Dylan was representative of the real people who were out there [fighting for civil rights],” Wald said. In 1964 came the invasion of British singers performing American-style music. “The Beatles are the only band in the history of music to have the top five songs of the Top 40. No one else has done that before or since,” explained Wald. This marked a turning point for Bob Dylan whose next album, Bringing It All Back Home, included several electric songs and marked Dylan’s break into the US top 10. When the 1965 Newport Folk Festival came around, Dylan returned this time as one of the big stars rather than an unknown protest singer. When Bob Dylan took the stage in 1965, he sang his top hit “Like a Rolling Stone” in loud electric volume. The lyrics, “How does it feel to be on your own?” felt extremely poignant to an audience that had just experienced such a difficult year. This song choice was one reason that Dylan was booed off the stage, another being that his group, the Butterfield Blues Band, was too loud and rocking for the festival. “[Out of all the Chicago blues bands] the first one to make it to Newport was a group of white college kids,” commented Wald. Dylan’s band was exactly the sort of popular music that Seeger had been trying to avoid. Hannah covers events for the Humanities Center for the College of Humanities. She is a junior pursuing a degree in art history with a minor in art.